Anyhoo, our journey continued and we arrived excitedly to the doorsteps of Ben’s Kosher Delicatessen on a cold January evening. I believe the contained excitement prevented me from taking photos of the doorstep, so you can check out what their front door looks like by clicking here. They also have 7 other locations in New York and Florida, click here to see the list. The restaurant had a lovely homey vibe with ample booths and tables along with a counter seating area where the servers come and go. At the time we arrived, most of the restaurant had been reserved for a private party, so we were asked if we were okay to sit at the empty counter area which was fine. Since we didn't know what to expect, we decided on ordering one Overstuffed Hot Pastrami Sandwich on Rye (12.49) along with one bowl of Ronnie’s Old Fashioned Chicken Soup with a Matzo Ball (4.99) to share. 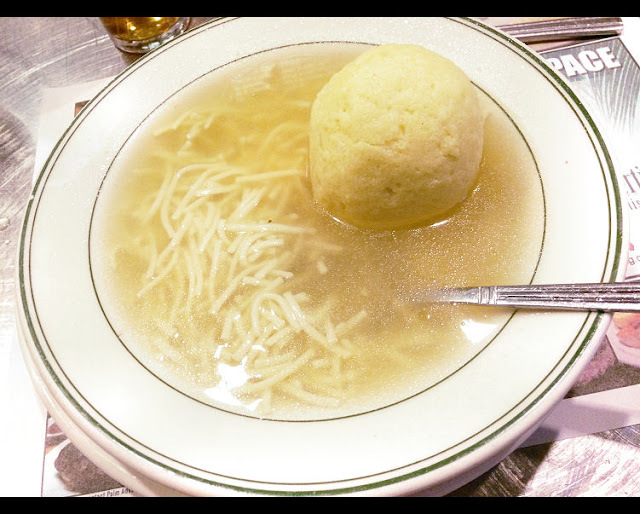 What’s a Matzo ball? I don’t know! But I’ve heard the word so many times that I was like yes, this is moment to discover! 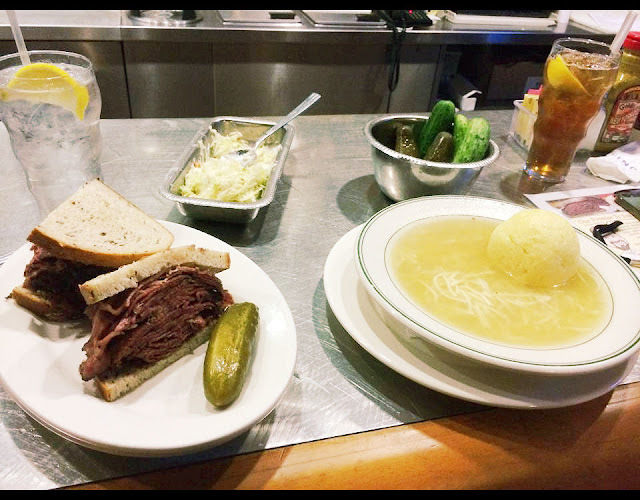 Hot Pastrami Sandwich on Rye, Chicken Soup with Matzo Ball, and complimentary coleslaw and pickles. What you’re looking at is a masterpiece. After ordering we were immediately served our drinks (water and a lovely iced tea) and were promptly presented with a bowl of delicious coleslaw and a bowl of pickles, both refillable on request if my memory serves me correctly. Can we take a moment to step back and appreciate the full lemon wedge in our drinks? I know I may seem like I’m exaggerating since most restaurants serve lemon wedges but something about a huge lemon wedge in my drink without my asking for it just makes me feel great. Ahem, getting back to business, the coleslaw was crunchy and refreshing and the pickles were something else. You could taste the homemade quality about them, they weren't the overpowering sour you’d expect from dill pickles, they were lightly seasoned and just perfect. Let’s talk about this sandwich. This Overstuffed Hot Pastrami Sandwich on Rye. This was one of the best sandwiches I've ever had in my life. The pastrami was warmed and just FANTASTIC. I can’t explain the flavours to you but it was just exceptional. Pair that amazingness with the awesome deli-style mustard on the counter which did not contain any wine vinegars and just .. yay! Do you see the amount of meat in there? One half of that sandwich was like a full sandwich. I'm pretty sure it was around a pound of meat in there. I was so enamoured by that pastrami that I asked if I could buy some to take home, and actually, you can! But the price was sky-high (and for good reason!) so I had to pass. Don't mind me, I'm just a planet-sized Matzo Ball. The Chicken Soup with a Matzo Ball was warm and comforting, everything you would want on a cold January evening. The highlight of this soup was the massive Matzo ball which protruded at least a mile outside of the bowl, or so it seemed. The texture was like a dumpling with a little more of a bite, but was easily cut into pieces with a spoon. It didn't have any explosive flavours but that’s what made it great, just a fist-sized dumpling-like addition to an already comforting bowl of soup. Yup, I loved this soup. This place takes the cake. The service was fantastic, the atmosphere was lovely, the food was just beautiful. The two of us were stuffed after sharing ONE sandwich and ONE bowl of soup! This was an exceptional choice for my first Kosher Restaurant experience, and since we've been here I now always look for Kosher restaurants to try when we travel. To me, this restaurant represents an ideal of what every Halal restaurant across the country should be: Consistently excellent, and loud and clear about the authenticity of their ingredients. We should be able to hit up any Halal restaurant’s website and be able to see their certification displayed for the meats they serve along with a clear description of where their meat comes from, and not have to interrogate servers or owners to ensure we’re eating Halal. Though there are already a lot of Halal restaurants who are already at this standard, I hope to see day when every Halal restaurant meets them and goes beyond. Thanks for the lovely experience, Ben's! 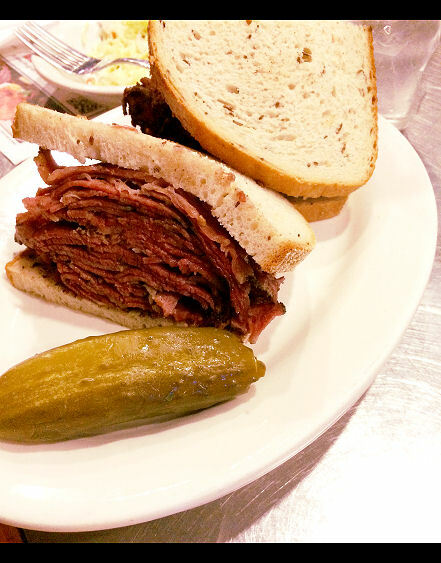 Question for our readers: Have you ever been to a Kosher restaurant? Do you have any recommendations? Let us know below or on Facebook!